Invaluable tricks and techniques for getting your basslines sounding awesome! EQ tweaks can help you bassline to sit better in the mix. We've already regaled you with a cornucopia of bass sound design and programming techniques to incorporate into your production workflow, but we're not done in the low-end department just yet. In this third collection of bottom-enhancing tips, we aim to help you fit those lovingly crafted MIDI and audio parts into your broader arrangements, and get them sounding tight, phat and cohesive in the mix. Many of the best basslines are practically hooks in themselves, but don't feel like you always have to show off the Crown Jewels immediately. Sure, a bassline can be a great introduction to a track, but there's a lot to be said for holding it back for a few bars to build anticipation, too. Also, try starting with a simplified version of the bassline and building up to the full groove gradually. If you want to introduce a big bassline as part of a drop, one well-worn trick is to use a high-pass filter during the eight bars (for example) leading up to it. If you automate this so that the lower frequencies of the sound are introduced gradually, you'll build anticipation and create a bigger impact when the full sound kicks in. Even if you think you've got the best bassline in the world, try to resist the temptation just to loop it throughout the entire track and leave it as it is. Subtle changes to note timings at certain points can have a greater impact than you might expect, and little flourishes at the end of every four- or eight-bar section (or just before a chorus, for example) can help to keep things interesting for the listener. 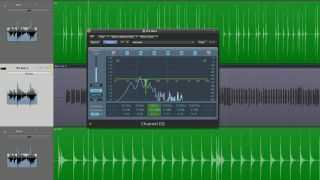 Everyone knows that a decent monitoring setup is crucial for fruitful mixing, but this is particularly true for basslines. You won't really be able to hear what's going on with your low-end frequencies if you don't have a good set of speakers (or, at a push, some high-quality production headphones), so investing in some is highly recommended. One other option is to add a sub-woofer to your setup. This will enable you to get a much better feel for how your bassline's sub frequencies are working. If you can't stretch to one of these, a spectrum analyser can give you a visual guide to what's going on down there. Although the bass guitar and kick drum can be best friends, their frequencies sometimes clash. If you're having this problem, try notching out some of the kick frequencies from the bass part. A spectrum analyser can help you to find these (try starting your search around 90Hz). Once you've located them, use a narrow Q to pull a few dB from the bass. It's common practice to create basslines using multiple layers. When the time comes to start mixing, it can be very useful to route these layers to a single buss so that you can apply processing to them together, while also retaining the ability to tweak each layer individually. Is your bassline lacking a certain sense of fullness? Try sweeping a bell-shaped EQ boost through the range between around 500Hz down to 150Hz. A broad boost of just a few dB can often be enough to provide the low-mid glue that's required. You might also find that your mix is sounding too full in this same range. In this situation, it might be the case that the frequencies of other instruments - pianos, guitars and synth pads, for example - are cramping your bass's style, so each one will require individual attention in order to strip things back a bit.